Our country has both challenges with chronic pain as well as opioid misuse, abuse, diversion and overdose deaths. Recognize we use opioids to treat pain, how do we address this conundrum? This was the topic of a Senate Special Committee on Aging on February 24th, 2016. I was honored to testify on behalf of the Institute of Medicine and was asked to represent the work we did on the IOM Reliving Pain in America Committee. This effort was led by Chairman Senator Susan Collins (R-ME), Ranking Member Richard Donnelly (D-IN; sitting in for Senator Claire McCaskill (D-MO) who was just diagnosed with breast cancer), and joined by Senators Warren, Casy, Kaine, and Blumenthal. The full hearing can be found here: http://1.usa.gov/1WJzkz5. I was prepared for this testimony and the Q&A session to be highly charged and potentially confrontational. After all, the media presents on an almost daily basis both young and old dying from opioid related deaths. Just the night before, Frontline presented a powerful contemporary look into the increasing heroin problem our country is facing. It is understandable to want to be angry, to react, to point fingers, and to dramatically restrict the use of opioids – all with the laudable goal of reducing opioid related negative consequences. I share that goal. I am also highly motivated to care for people suffering in pain. As a Pain Medicine physician, I know that for chronic pain, opioids are rarely a first line agent. However, I see patients all the time that are taking their opioids responsibly and seeing a persistent increase in quality of life and decrease in pain. Patients like Leslie, age 73, whom I saw the day before flying to Washington D.C. Leslie has bad nerve pain in her legs and takes a small amount of opioid in the AM to help her function. She takes a second small amount in the evening that helps to reduce her pain so she can sleep. She has tried many other treatments (pharmacologic and otherwise) and finds that this approach has worked for her for many years. She displays no risky behaviors around her opioids. Her message to me was: "Don't let them take away our medications without giving us something in return." I went to D.C. with that message in mind. And to be clear to the readers - I am neither "pro-opioid" or "anti-opioid. I am "pro-patient". And I receive no money from pharmaceutical industries. My goal was to present our findings from the Institute of Medicine Relieving Pain in America report and the NIH/Health and Human Services National Pain Strategy (NPS). Both can be downloaded for free and found here: 1) http://bit.ly/1n8m2Qi and 2) http://1.usa.gov/1RxBMr3. Sean Cavanaugh, Deputy Administrator and Director of the Center for Medicare, Centers for Medicare & Medicaid Services, Washington, D.C.
Ann Maxwell, Assistant Inspector General, Office of Evaluation and Inspections, Office of Inspector General, U.S. Department of Health and Human Services, Washington, D.C.
All made compelling opening comments and responded superbly to the questions. Each, of course, is looking at the problems through their own "lenses" and representing their view of the challenges and solutions. It is clear that it will take such a multi-disciplinary approach if we are to solve these problems. From my perspective, I am of the strong belief that release and implementation of the National Pain Strategy will be a critical part of the solution to both problems. While there were many aspects of the hearing that I found compelling, there was one that particularly stood out. That was the discussion about the unintended consequences of patient satisfaction surveys on motivating physician behavior to prescribe more opioids to keep their patients happy. Senator Collins (with several other Senators) recently wrote a letter to Secretary Burwell outlining this concern: http://bit.ly/1TfPKl8. This is a very real issue and one that needs to be addressed. 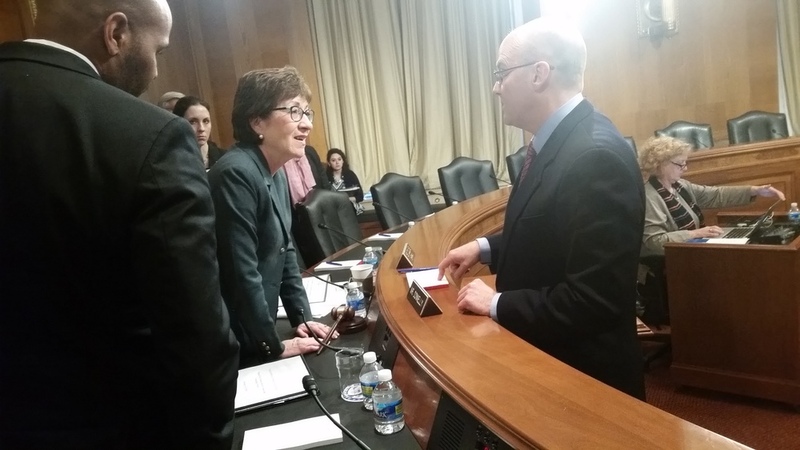 I had the opportunity to discuss this with Senator Collins afterwards and the fact that the problem extends well beyond the hospital environment and is of major concern in our outpatient settings. She seemed both interested and engaged. Bottom line, we need to make sure that we are: 1) optimizing the patient experience, 2) using the right tools/surveys to do so, and 3) not inadvertently motivated other behaviors that would be bad for the patients. In closing, I need to thank Jim Jensen from the IOM (http://iom.nationalacademies.org/) and his staff who were wonderful in helping with the meeting. And a special shout out to the Mayday fund (http://www.maydayfund.org/), and Carol Schadelbauer and Alisa O’Brien from Burness (http://www.burness.com/) for their wonderful assistance. This is both a challenging and exciting time. Challenging because of the very real problems with both pain and the opioid epidemic. Exciting because there are available solutions (e.g. National Pain Strategy) that can provide cultural transformation we need in how this country cares for those in pain - and help address this very real opioid problem. My oral testimony below outlines this in more detail. Overall, an incredible experience and one that I am hopeful will make an impact.